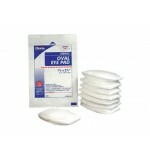 These Sterile Eye Pad's are soft and gentle to the touch and offer protection to the site. The sealed edges provide minimal linting, and the easy place tab on the back ensures clean placement. They are individually wrapped and packaged in a dispenser box for your convenience. Eye Pad, O..